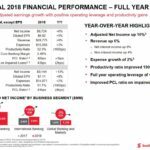 Scotiabank (BNS) released its Q4 and FY2018 results on November 27, 2018. BNS has underperformed its Big 5 counterparts over various timeframes and shares are currently off ~21% from the 52 week high. Rather than view this as a negative I encourage investors to view this as a positive. The time to invest in great companies is when shares are 'on sale'. BNS is a well run bank and I fully expect its earnings multiple to revert to the mean in due course. In the interim, shareholders are rewarded with a safe and attractive dividend. BNS has exhibited the worst 52 week stock performance of the Big 5 Canadian Schedule A banks. Its substantially smaller exposure to the broad commercial/corporate US market relative to its peer group might finally be a positive if the US forges ahead with its decision to impose a new round of tariffs. BNS operates in Mexico, Chile, Colombia, and Peru where the demographics offer substantial growth potential. Risk management/mitigation is critically important in the financial institutions. BNS is a conservatively managed and well run bank. Long-term investors would be wise to look at BNS’s dividend growth track record and growth potential. Perhaps it is the allure of hitting a ‘home run’ that attracts investors to speculative companies. I, however, am of the strong opinion that long-term wealth creation can be achieved by adopting a disciplined investment approach and focusing on well managed and financially sound companies which have competitive advantages. This brings us to the subject matter of this article and the next few articles I will be writing regarding the Schedule A Canadian banks. I encourage you to click on this link and to plug in various start/end dates and to compare BNS’s performance with its peer group; US currency is used on this external site. Despite my upbeat long-term outlook on the Big 5, I indicated in my September 5th article that I was of the opinion various headwinds/uncertainties made me reluctant to acquire additional shares in any of the Big 5 other than through the automatic reinvestment of all dividends; subsequent to that article the share price of the Big 5 has dropped ~7% - ~10%. I view this price drop from a positive perspective since I do not have any intention of selling my shares. I merely wish to increase my holdings so as to create a greater stream of dividend income. We have now entered the period in which the Big 5 will be releasing their Q4 and FY2018 results; BNS is the first of the Big 5 to have released its results. In this article I touch upon why I am of the opinion BNS, which has been underperforming its Canadian peers over various timeframes, warrants a ‘buy’. 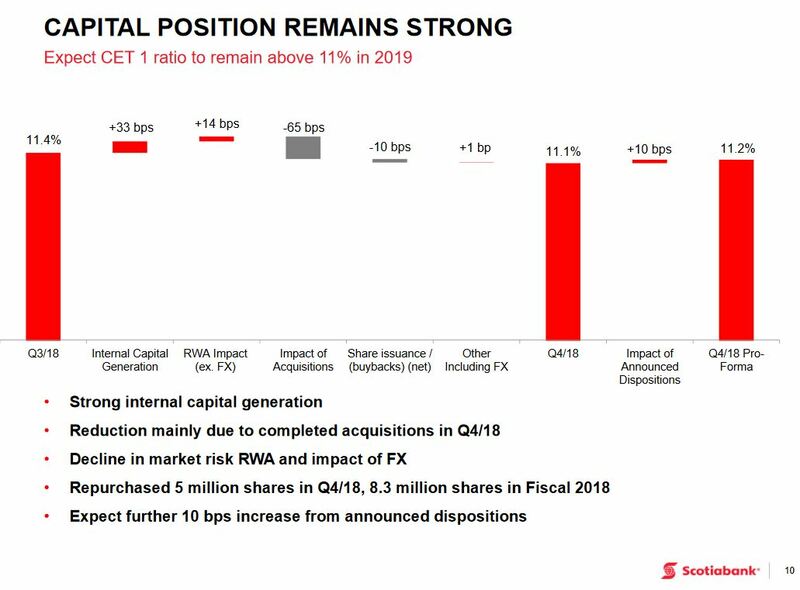 If you look at BNS’s Q4 and FY2018 Investor Presentation you will see that loan losses over the past few quarters have been extremely low. In fact, loan losses are at or near record low levels. It has been well publicized that the ‘average’ Canadian consumer is heavily indebted. As interest rates rise and an expected slowing of the economy materializes it is not hard to fathom that Canadian delinquency rates will creep higher in 2019. Delinquency rates (ie. credit cards, auto loans and other non-mortgage liabilities) earlier this year were close to the lowest level since the 2008 Financial Crisis. With the Bank of Canada having raised rates several times since mid-2017 it is hard to fathom how many consumers who have been using various forms of credit to sustain their lifestyle will not feel increasing strain on their finances. In addition to a rising interest rate environment which will negatively impact the heavily indebted Canadian consumer, there are also well publicized problems in the energy sector which have had a significant negative impact on Alberta’s economy; the province’s books are not expected to balance until 2023! Please see this brief interview in which the vice president of Oil Sands at the Canadian Association of Petroleum Producers provides his reaction to Alberta's 2018 - 2019 Budget and how it will affect the energy sector. Heavy Canadian crude has been declining since mid-May, with prices plummeting by more than 60% amid a lack of pipelines and glut of supply. This has resulted in the worst pricing environment in the history of Canada’s oil industry…an industry which accounts for ~10% of Canada’s economy and ~20% of exports. BNS, the biggest Canadian lender to oil and gas (O&G) companies, has not been complacent in the management of its O&G portfolio. Over the past 3 – 4 years it has reduced its portfolio risk by focusing more on energy firms with a stronger probability of being able to weather downturns. We also have far more significant macro issues (eg. Brexit, increased US protectionism) that are bound to continue to be headwinds. Although BNS has the least exposure to the US economy, having decided many years ago to focus on growth in the LatAm region (ie. Mexico, Chile, Peru, and Colombia), it is hard to fathom how a slowdown in the US economy would not hurt BNS. In a recently released report sponsored by the pro-free-trade Koch Industries, it was concluded that Trump's threats to boost tariffs on Chinese products, impose tariffs on auto imports, and continue tariffs on steel and aluminum could take a major chunk out of the US economy. Just recently, the US President indicated it was ‘highly unlikely’ that the US and China would reach a deal to avoid an increase of the tariff rate on US $200B worth of Chinese goods to 25% from 10% come January 1, 2019. This same individual has also indicated in recent weeks the potential imposition of auto tariffs. As if a trade war with China isn’t bad enough we now have officials from the European Union and other major partners that have warned that retaliation could become a reality if tariff threats become reality. To a lesser extent, but still significant, you have the recent announcement by General Motors of its intent to close its Oshawa plant in 2019. This certainly is not nearly as significant as the above noted macro events but nevertheless it certainly doesn’t help the average Canadian who will be impacted by GM’s recent announcement. I strongly suspect many of these impacted employees (and suppliers) have some form of credit facility with BNS or one of the other Big 5. In addition to the above, BNS has lagged some of its Canadian peers on the wealth management front. 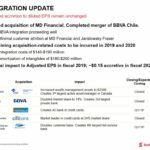 In an effort to bolster this area of the bank BNS made two significant wealth management related acquisitions (Jarislowsky Fraser and MD Financial Management) earlier in 2018. BNS paid up for these entities and they are not expected to be accretive to earnings until 2020 at the earliest. Okay, so if there are so many negatives on the horizon, why invest in BNS now? …Because BNS shares are so beaten up and because it has the least exposure to the US economy of all Big 5. If the US continues with its confrontational tactics I envision other major economic countries/regions will escalate their retaliatory tactics. I encourage you to read this informative article published by The Brookings Institution which is a nonprofit public policy organization based in Washington, DC. ; Brookings’ mission is to conduct in-depth research that leads to new ideas for solving problems facing society at the local, national and global level. BNS operates in regions which are aggressively promoting international trade. The benefits of this are borne out when you look at the extent to which countries like Chile, Peru, and Colombia have grown in recent years; these countries have a rapidly growing middle class. The same cannot be said for the US. 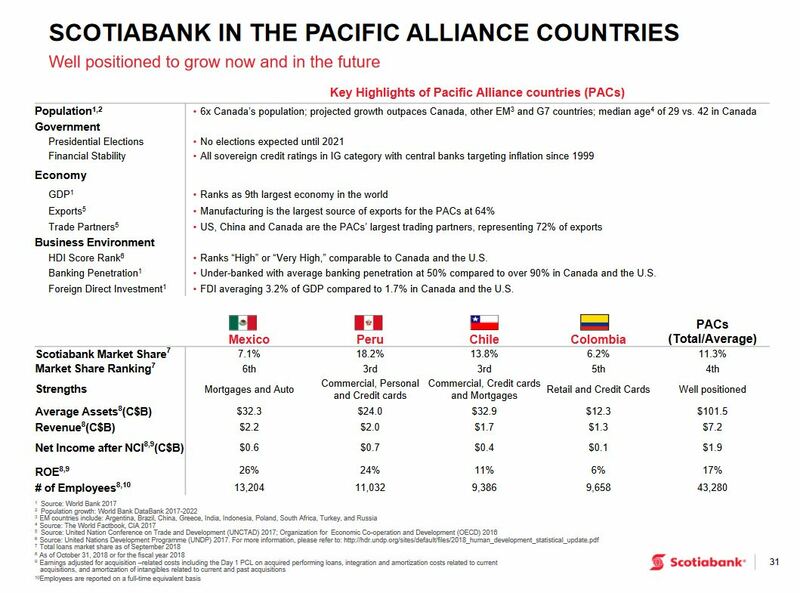 I fully recognize that BNS is not the top 1 or 2 bank in Mexico, Chile, Peru, and Colombia and market share, revenue, and net income generated from the operations within these countries is small relative to domestic Canadian results but one needs to remember that BNS’s operations in these countries as little as a decade ago pale in comparison to current results. 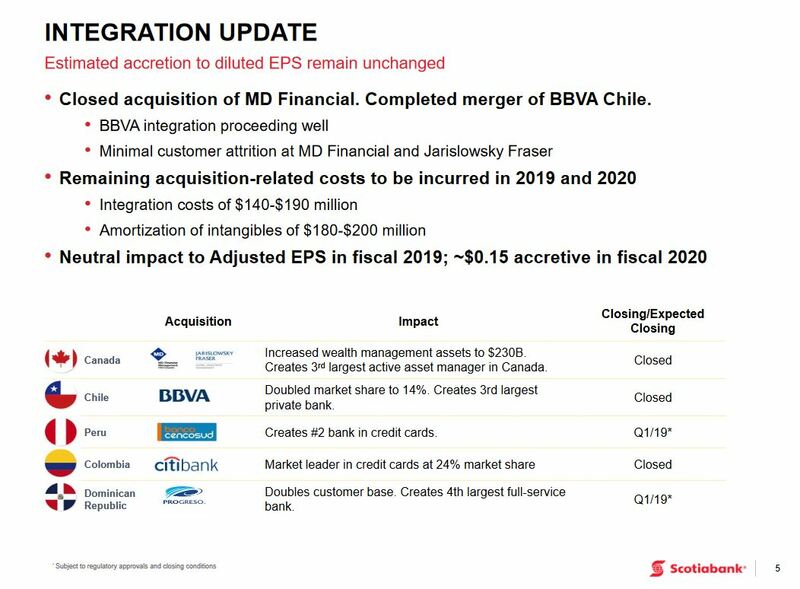 The bank has been making strategic acquisitions in these countries because the long-term macro environment (economic and political) is positive. 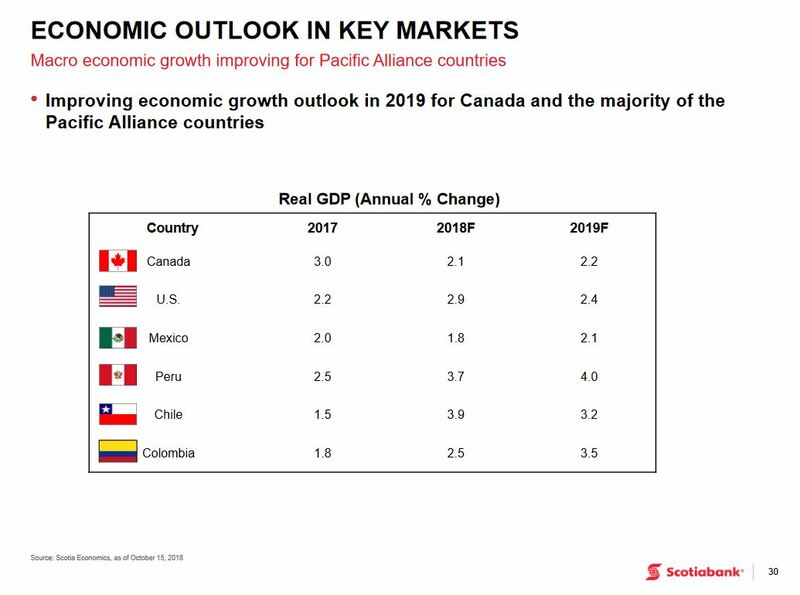 This does not mean operating in these countries is as easy (relatively speaking) as operating Canada but BNS has been in these countries long enough to know what it takes to grow profitably. BNS’s News Release can be found here and a detailed investor presentation can be found here. Q4 EPS of $1.77 missed consensus by $0.02. Common equity Tier 1 capital ratio slipped to 11.1% at October 31, 2018 versus 11.4% at July 31, 2018. BNS, however, reported adjusted EPS for FY2018 of $7.11/share which exceeded consensus by $0.10/share. This is even after the $0.29/share negative impact of acquisition-related costs on diluted EPS. I encourage investors not to focus exclusively on quarter to quarter comparisons as this is somewhat short sighted. A YoY comparison is, in my opinion, a superior comparison (although not as good as over several years). 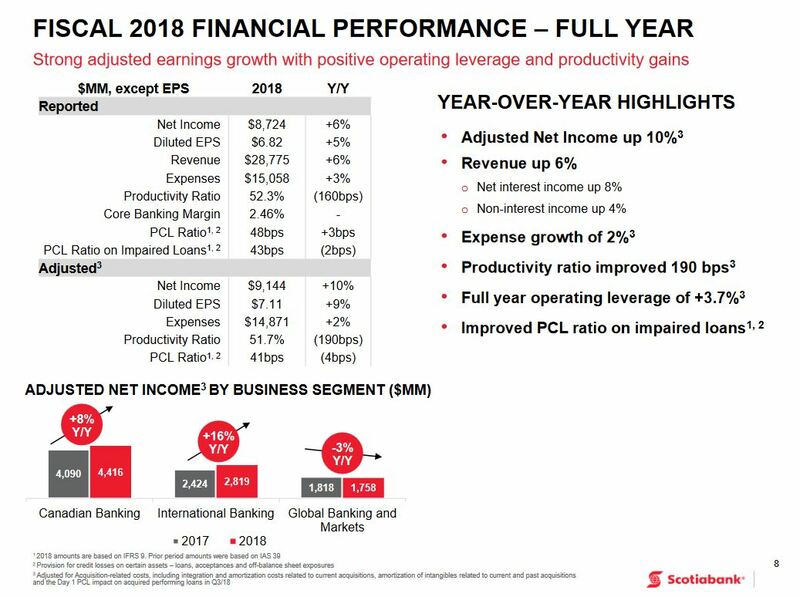 While Canadian Banking and International Banking performed well in FY2018, Global Banking and Markets results were weaker than in FY2017. This business is ‘lumpy’ in nature and when corporate actions are on the slow side this will obviously have a detrimental impact on this division’s results. This is just the nature of the business. 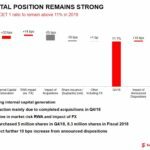 On the November 27 conference call with analysts, BNS indicated it is optimistic it will continue to perform strongly and again exceed medium-term objectives (ie. 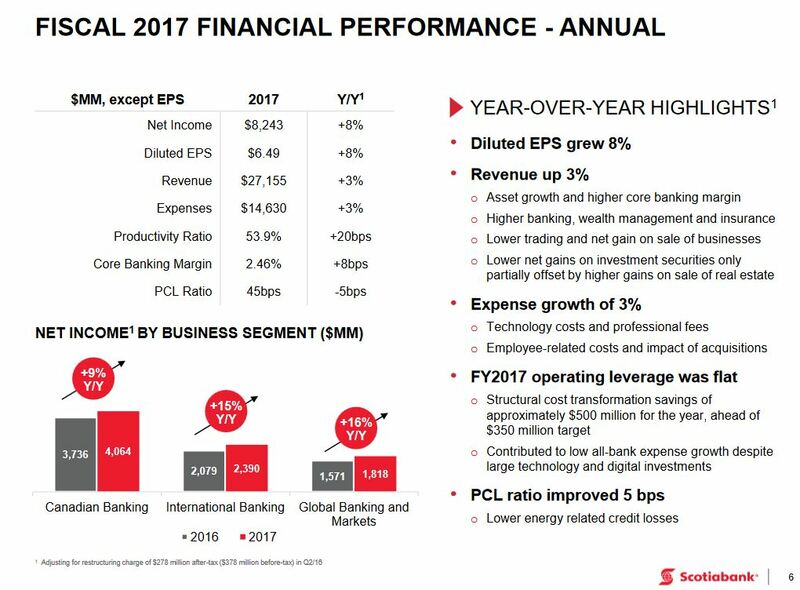 EPS growth of 7+%, ROE of 14%+, positive operating leverage, strong capital levels). The banks, fortunately, are currently in a rising interest rate environment which is positive for margins. On the Canadian Banking front, management expects higher revenue growth and mid single-digit expense growth. Residential mortgages are expected to grow at mid single digits and higher organic growth in credit cards and business volumes are projected. 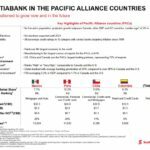 Canadian Banking is expected to generate growth in line with the bank’s medium-term target of 7%+ and the outlook for International Banking continues to remain positive; International Banking will be focused on integrating recent acquisitions in Chile, Peru, Colombia and the Dominican Republic. The Global Banking and Markets business is expected to grow in 2019 despite FY2018’s weaker results due to challenging market conditions. 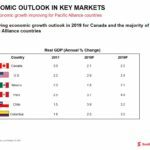 The bank is building out its investment in corporate banking presence in Canada and internationally and there is cautious optimism there will be improved market conditions for the bank’s capital markets and trading business. I think far too many investors overlook the risk aspect of their equity investments. I always check the credit ratings of companies in which I invest and, quite frankly, I place a higher weighting on the risk aspect of my analysis when it comes to reviewing a financial institution than a company in most other industries. Much of this has to do with the fact that once the investment and business community starts to lose confidence in a financial institution because its risk level is excessive, things can turn ugly pretty quickly. I learned this from my exposure to the banking industry, an industry in which I was employed during my entire career. I entered the workforce in the summer of 1980 in Calgary, Alberta. The economy was booming at the time but less than a year later cracks started to show. By 1982, the economic conditions in Western Canada were brutal and I witnessed the demise of Canadian Commercial Bank and Northland Bank…and smaller trust companies shortly thereafter. I like to reflect upon this period as my ‘eye opener’ to the importance of risk mitigation and diversification. There were subsequent periods in which the Canadian financial institutions experienced challenging conditions but perhaps there was no other period than the Financial Crisis in which risk mitigation was top of mind…every day. During the Financial Crisis I was employed by BNS. I witnessed firsthand the extent to which many financial institutions throughout the world were in a precarious financial position. I remember when our correspondent banking team received a mandate to cancel or significantly reduce uncommitted credit facilities that had been in place for years. While communication was made with these correspondent banks to explain the rationale for the bank’s decision, cut backs or cancellations were not up for negotiation. While the correspondent banks were not pleased with BNS’s decision, they fully understood the reasoning and, in fact, they were undoubtedly doing the same thing to their correspondent banks. It was, essentially, survival of the fittest. The Big 5 in Canada were, fortunately, some of the most financially sound banks in the world. They were just doing what they could to minimize the impact of the financial contagion. I specifically remember specific global investment banks (names withheld for confidentiality reasons) who desperately requested the immediate return of very sizable deposits (billions of USD) held with BNS in an effort to stave off financial disaster. These experiences taught me the degree to which risk control/mitigation is so important within the financial institutions sector. I fully recognize that the ratings agencies failed the investment community pre Financial Crisis when investment grade ratings were assigned to utter garbage. I am of the opinion, however, that these ratings agencies learned an expensive lesson they do not wish to repeat. I am also fully aware that the level of oversight by the Office of the Superintendent of Financial Institutions (OSFI) has increased exponentially subsequent to the Financial Crisis. The level of interaction between the Big 5 and OSFI is so significant I have a very difficult time imagining how one of the Big 5 could fail without OSFI having had ample prior warning. Sure…there are huge costs associated with such a highly regulated industry. I strongly suspect, however, that these costs are far lower than what would materialize if confidence in the Canadian financial system were lost. As for BNS’s exposure to the Caribbean (BNS has struck a deal to sell non-core operations in 9 of the smaller countries in the Caribbean, such as Antigua and Dominica, as it continues to narrow its presence in international markets - this is part of a strategy that began 5 years ago to sharpen focus, increase scale in core geographies and businesses, improve earnings quality, and reduce risk to the bank), Mexico, Chile, Peru, and Colombia…. There is absolutely no question that the country risk for this region and countries is higher than Canada and the US. BNS, however, has operated in these countries for years and it employs high credit standards just like it does in Canada. Given its history of operating in these countries during various types of economic environments, I am not concerned investors will suddenly see a surge in delinquency levels should these countries experience softer economic conditions. I am confident BNS will manage its book of business accordingly. An important consideration is the demographics of Mexico, Chile, Peru, and Colombia. The median age is much lower than in Canada, the population is far greater than in Canada, and the ‘middle class’ is growing rapidly. I view significant growth opportunities for BNS in these countries. BNS's current ratings and outlook from 4 ratings agencies meet my requirements. Finally, I strongly encourage you to review pages 32 – 38 of the Q4 Investor Presentation in which the bank provides an overview of the risk aspect of its various credit related lines of business. 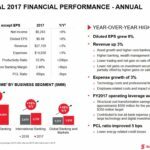 BNS’s reported $6.82 of EPS for FY2018. Add back a $0.29/share impact of acquisition-related costs on diluted EPS and we arrive at FY2018 adjusted diluted EPS of $7.11. Using BNS’s medium-term financial objective of 7%+ EPS growth we should then anticipate that BNS is targeting at least ~$7.30 in EPS and at least ~$7.61 in adjusted diluted EPS. With BNS currently trading at ~$70.15 we get a forward diluted PE of ~9.61 (5 year average is closer to 12) and a forward adjusted diluted PE of ~9.22. I view BNS as being at the low end of its fair value range. In my September 5th article to subscribers I indicated the Big 5 have a history of rewarding shareholders from a dividend income perspective. Unlike many of their foreign peers which dramatically reduced their dividends during the Financial Crisis, the Big 5 merely froze their dividends, albeit for different time frames. In August 2018, BNS announced a dividend increase ($0.82/share increased to $0.85) effective with its Q4 dividend which was paid late October; BNS’s common stock dividend history can be found here. I fully expect BNS will pay another $0.85/share dividend in January 2019 after which time it will likely increase its quarterly dividend to ~$0.88/share; this $0.03/share increase would be identical to the last 3 increases. I also expect the October 2019 dividend to be increased by $0.03/share. Based on my projections, BNS’s dividend for FY2019 would be $3.52 calculated as follows ($0.85 + (2 x $0.88) + $0.91). Stocks screeners reflect a forward dividend of $3.40 and an annualized dividend yield of ~4.79% based on the current $70.15 stock price. Using my dividend growth projections which are based on BNS’s historical dividend growth pattern for the past few years, the forward dividend yield is closer to ~4.85%. Using the Tickertech performance screener tool provided in the Introduction section of this article I have compared BNS’s performance to the other members of the Big 5 over several different timeframes. In just about every comparison I have performed, BNS’s return with/without dividends has been inferior to the other four banks. I strongly suspect this is the result of BNS’s conscious decision not to enter the ‘over banked’ US market. I do not envision BNS suddenly reversing course and deciding to enter the US market. There is a strategic game plan in place to build marketshare in ‘up and coming’ jurisdictions. The plan is working. It just takes time and you need the patience of Job. BNS’s shares could certainly drop further but the fall is likely to be less than that of some of its more richly valued peers. A temporarily beaten up stock price allows you to acquire shares at a lower price. BNS shares are highly likely to revert to the mean. While you patiently wait for this to happen you receive an attractive and growing (and just as importantly….safe) dividend. When I invest in a company I do not just look at the capital gains opportunities; I very, very, very rarely initiate a position with the intent of exiting my position. My game plan is to invest for the long-term and my primary rationale for investing in a company is that I want the underlying investment to create a stream of income whose growth can realistically be expected to outpace the rate of inflation for many years into the future. If you have a similar mindset then BNS might be a suitable long-term investment for you.